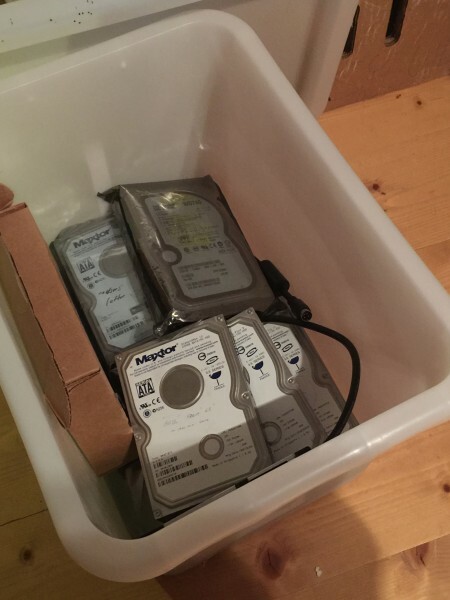 Recently I’ve casually discussed the idea of photo/data backup with friends and colleagues and quite frankly I am astounded at how much faith they place in a single hard drive computer system. Not just for photos, but everything. As in… no backup whatsoever. Ouch. Hey it’s only your memories, right? This post addresses some weaknesses in the management of digital assets (photo, video) and offers some suggestions so that you, as a casual or enthusiast photographer, can add redundancy in an effort to avoid loss of data. Sooner or later all hard drives will die. Sooner or later all hard drives will die, and all data thereon will die with them. Firstly, I am nowhere near what you would call a “prolific” shooter. As a matter of fact, I’m quite selective about when I pull the trigger, and rarely will you catch me mashing down on my shutter button, churning out frame-after-frame (I’m generally a “short burst shooter”, unless the situation calls for more frames). I can thank my photo apprenticeship on film cameras for that ($). However, I do shoot RAW format and have done so since 2007. Why do shoot RAW format? The short answer is that I like to eek out the most quality of my images. Although jpeg compression can provide very good quality images, it is still a lossy format and you are essentially throwing away data (quality) in exchange for smaller files. The raw format is basically the entire data set that the camera sensor captures when taking a photo, including a higher color gamut (more colors). Also, recovery of shadow details is much easier in RAW. However, there is no free lunch since RAW files are quite big (file size). In the case of a 36 MP D810 (Nikon), for example, images will weigh in at roughly 50-60 MB per photo (depends on your RAW settings). This adds up quickly if you shoot a few times per week, even casually. And even as a casual shooter, my data storage needs have grown by a factor of 10 in the past 7 years. You’d better have some redundant storage and backup strategies in place, also with room to grow. So in 2014 I shot just over 400 GB of RAW data, roughly 9 times what I shot digitally in my first 5 years going digital. 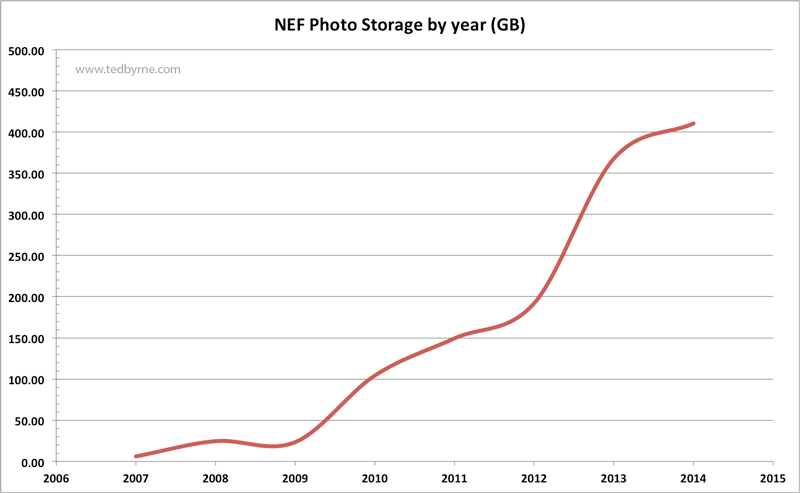 As I write this in early November, I ‘m currently at about 500 GB in new NEF so far for this year. This is only my RAW library. If I add all exported jpegs, iPhone/iPad backup, web galleries, 16-bit TIFFs, and large PSD edits and stitched panoramic files from the last few years, the actual storage capacity almost doubles. I estimate that I’m currently sitting with about 2 TB of combined photo data, as well as about 2 TB of other data (mostly video). That’s a heck of a lot of 1’s and 0’s for a casual shooter like myself. What about managing and storing that data? Well, shuffling around gigabytes of data needs a fast network – so no… not wireless – we’re just not there yet. You’re going to need fast hard drives, and a fast, wired network – at least USB 3 or Thunderbolt if you’re just doing computer-to-hard drive transfers; Gigabit Ethernet if you’re on a wired LAN. This is a schematic of my current working environment in my home office (which also ties into a Plex media centre, iTunes server and a family iMac computer). Since I tend to work on both an iMac and a Mac Mini I’ve included both if them in the overall sketch. Seems like a lot of arrows there, but it’s pretty simple once you break it down – you’ll see that I maintain one main repository for all my media – the Synology 712+ with a DX 213 expansion bay NAS (basically another name for a server). I’ve been using a various NAS brands for several years, and I’ve settled on the Synology brand because they are simply workhorses, and you don’t need to be an IT expert to set-up and maintain it (some experience helps though). At the time of purchase, the 712+ model was the best quality and speed for my price point. The DX expansion pack was added later when I needed room to grow, by adding 2 more drives and expanding the RAID. Maybe I’ll write up the NAS configuration in other post, but basically, a “RAID 5” configuration allows for 1 disk failure without losing any data. This is not the same as a true back-up strategy, however, but this redundancy simply permits you to replace a dead or dying drive asap, while your data remains intact on the NAS. The NAS will beep and send you an email when drives start failing regular self-checks. You’ll see in my drawing above that the NAS is actually mirrored daily to a local drive (WD Book) with an automated script (using ChronoSync). AND, then that mirrored WD Book data is itself mirrored to another drive once a week, which is moved off-site to my office… about 25 km away from my home. Moral: Create meaningful, physical distance between redundant sets of important data, as soon as possible and on a regular basis. Consider conducting at least daily, even hourly, automated on-site backups – at least use Time Machine (Mac) or something similar. This way you can be sure to have several copies of your images, going back several days, weeks, months in the past, if necessary. Get a copy of all your important data/images to another physical location (i.e. off-site). Seriously, houses do burn down, basements flood, and break-ins happen. If you have your back-up drive sitting just next to your main computer there’s still good chance that you could still lose both copies in the same stroke of bad luck. By having a third copy off-site, your chances or recovery have just improved immensely. The farther the distance between the two data sets, the higher the security. 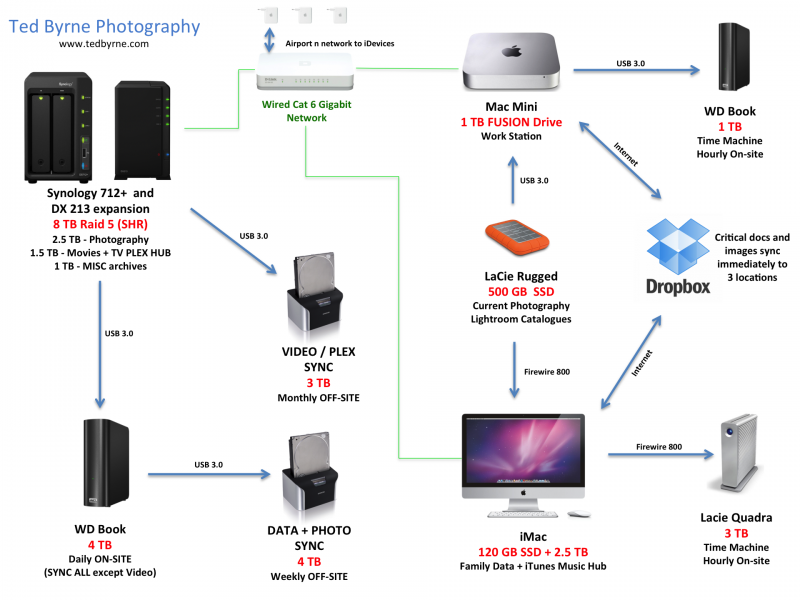 Obviously, cloud storage solutions (Dropbox, Google Drive, Amazon, etc..) can be ideal for this… if you shoot jpeg only. If you’re shooting RAW, however you’d better have a “fat pipe” internet connection because typical upload times for an ADSL connecion are probably too slow to be useful. For several hundred Gigabytes of data this this not a plausible solution. This is why I clone my backup drives and bring them to my office on a regular basis. My “lighter”, critical docs and images are sent to DropBox so there is some redundancy to farther locations as well. Traveling – need I say it ?… Camera goes in carry-on bag – not checked luggage! At the very least – memory cards in your carry-on! I know some photographers that will also snail-mail a USB thumb drive back home with copies of their images, in the case that something happens to their carry-on. For extended trips of even more than a few days, consider moving at least jpeg copies to another medium/location (iPad, cell phone, Dropbox, laptop, etc. ).